TRUE BLUE continues! Just like last year, it’s time to put the spot light on my favourite part of hockey: the fans and their stories! Hockey is so much more than a game in a rink, it is a passion that unites fans across the globe. There is still time to have your story featured, – if you are interested in finding out more details, simply send an e-mail to nucksaid@gmail.com with the subject line: TRUE BLUE 2015. I follow the sport of hockey all year round and did so for many years as a radio technician and TV camera man following the Dutch Hockey League for many local radio and TV stations in the Netherlands. My old co-worker, Tonny explained all of the rules of hockey to me and helped me understand the game. But some years ago, I met my good friend, Felicia from Amsterdam, and she told me to try the NHL app so that you can watch hockey games from the U.S. and Canada. The app is how I first saw an NHL game streaming online. It was an amazing feeling that I never felt or saw while watching the Dutch hockey games. First, I was for the Pittsburgh Penguins BUT my friend, Felicia told me to watch a Vancouver Canucks game. Since that first Vancouver game, I was sold and now follow EACH Canucks game during the season which many times means I must wake up in the middle of the night or 4:00 AM local Netherlands time when the Canucks are on TV. Due to the work week, and the early hour time of the Canucks games, I am able to finish the games by 7:00 AM, before I have to go to work. My family said that it’s not good for me to wake up in the middle of the night to watch all of the Canucks games BUT I still do! 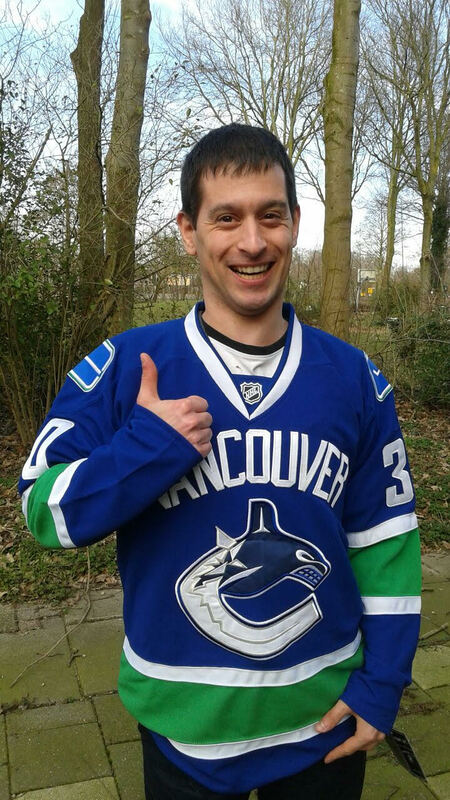 Last season, I bought a Canucks jersey AND a Hockey Canada jersey. I had them both framed hanging on my walls to make my house a hockey haven. Also, I joined a Game Day Canucks fan group on Facebook where I have made many new friends that I get to cheer with every game! My plan is to in a few years travel to Vancouver, BC to watch a LIVE Canucks game in Rogers Arena. My favourite moment from our Canucks last season was Eddie Lack doing a great job whenever he was called upon. I believe that the management team is doing a good job so far even if I do not necessarily agree with them trading Eddie. I have a very good feeling about the 2015-16 season and that it’s possible that they may hold on longer in the playoffs this season. I believe anything is possible in the new season! My game day rituals include sleeping, waking up by 4:00 AM and putting on my jersey to support the team before puck drop. I spend a lot of time during the season talking about the Canucks with friends and planning a trip one day to Canada to see a live hockey game. I cannot wait until October for the NHL and Canucks season to begin, I am counting down the days. Thank-you, Oscar for sharing your Canucks story with me and everyone else! That is so cool that you worked behind the scenes as a camera man and on the radio! I love hearing how fans learned about the game and how it captivated them. I understand not being a fan of the Eddie Lack trade, that was a tough one and unfortunately it was one of the very tough choices that had to be made. That being said, I am most definitely cautiously optimistic about the changes made moving forward and look forward to the seeing what transpires when that puck finally drops on October 7th. Keep your eyes peeled for more True Blue stories as we continue to count down to the new season just around the bend! It’s THAT time of year again, folks! TRUE BLUE is back this year! Just like last year, it’s time to put the spot light on my favourite part of hockey: the fans and their stories! Hockey is so much more than a game in a rink, it is a passion that unites fans across the globe. There is still time to have your story featured, – if you are interested in finding out more details, simply send an e-mail to nucksaid@gmail.com with the subject line: TRUE BLUE 2015. Are you ready for True Blue 2015? “How did you become a Vancouver Canucks fan? I am relatively new fan of the Canucks, having only watched the team play since the 2010 Olympics. One of the younger boys in my grade 4/5 class always talked about being a goalie with Roberto Luongo as his hero. So, I researched this “Luongo” person to find out WHY he was idolized by my student. The Olympics arrived and I watched the Men’s hockey games with Luongo on the roster. Watching that final GOLD medal game with Luongo in net, I could now understand why Ryan, my student was inspired to be like him. I was hooked and since then I have watched almost every single Canucks game. I try to attend at least one Canucks game a year. If I lived in Vancovuer or closer vicinity, I would probably be a season ticket holder. I do not profess to know ALL the rules as some fervent fans do, but I do acknowledge and enjoy watching a skilled player and/or team perform. What is it about hockey and the Vancouver Canucks that keeps drawing you back? Watching the Sedins do their magic on the ice. As well as some of the unsung heroes like Hamhuis and Tanev who play well but are not spot-lighted as much as the twins. Also Burrows for his sheer drive and determination. My favourite Canucks memory is when Kevin Bieksa scored the double overtime goal against the Sharks, sending Vancouver to the Stanley Cup Final in 2011. The puck disappeared from the player’s sight momentarily after hitting the stanchion. All the players on the ice were looking around for the puck, except for Bieksa who nailed it right into the net. SCORES!!! After the absolute torpedo that was the 2013-14 regular season (aka the Torts era), how did you feel about the 2014-15 season (aka the start of the beginning of the WilLindEnning era)? Honestly, I had trepidations about Tortorella being hired but did not vocalize my thoughts often, believing that the powers-that-be always knew better than the fans. With the newly hired trio, I breathed a big proverbial sigh of relief – THREE well-respected and knowledgeable people to look after the Canucks organization and team. YAY! What was your favourite/standout moment of the 2014-15 season? Nothing really stands out, just the difference in the team’s overall play. They seemed to play each game with more heart, more energy, more spirit, more cooperative and collective effort. I was just happy to see the team play as well as they did. Adding Radim Vrbata (a fellow countryman) to the team was a good sign. He fit into the roster extremely well. How do you feel about rookie president, Linden (and coach Desjardins) moving forward after their first year at the helm? There will be good things in store for all Canucks fans. These two are working well together and will bring the Canucks back to the forefront of the good NHL teams. After seeing a return to the post-season in 2015, how do you feel about the upcoming 2015-16 season? This will be an awesome year! Who is your favourite player(s) for the team? I respect and like all the members of the team. They each have their own special niche in my mind. The Sedins for their skilled plays – my jersey is #22 only because I had to pick one. Hamhuis because of his quiet personality and good defense. Tanev for his persistence and work effort. Vrbata for his great work ethic on ice and quiet celebration after a goal. Bieksa (yes I know he was traded) for his quirky on-camera comments and the leadership he displayed on the ice. Bo for his youth, energy and enthusiasm to do well. I could comment on each player but I will refrain. Generally, I like them all equally. Which rookie/prosect has you most excited? All of the rookies this year are going to be exciting. Bo Horvat has already shown what he can do and is progressing well. The others will prove themselves as well over time. Which Canucks players (past or present) would you like to meet and talk with if you could? I have never met any of the players but would like to talk to Dan Hamhuis. He seems to be very approachable to talk about life in general and because he is not often spot-lighted by the media. I would not mind meeting all of the players but would probably be too overwhelmed to even say anything. The behind-the-scene staff would also be very interesting to talk to and I would not hesitate to ask them questions. What would you like to see change in the NHL? I would like to see Gary Bettman step down as Commissioner, he has been there too long. First, thank-you, Helen for taking the time to participate and share your story with all of us! I love learning how fans discovered the game and what they love most about it. I must agree about game five vs. San Jose…THAT double overtime Kevin Bieksa goal is definitely one of my most favourite moments in Canucks history. Even more than any goal, I think my most favourite Bieksa memory, is the work he did with MindCheck helping to shine a light on the importance of mental health awareness. As for the Gary Bettman issue, it seems as though he is in for the long haul despite the outcry of many hockey fans. As for the upcoming season, I look forward to enjoying every moment of the 82-game journey…every moment good or bad, I am ready for October. Is it October yet? No, not just yet but I can hear the echoes just around bend.